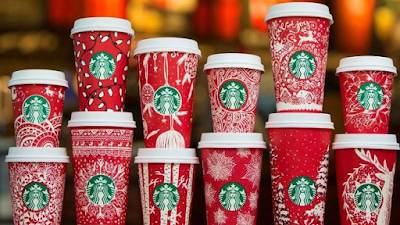 Just Keep Sweating: It's Red Cup Day! As an avid Starbucks drinker I look forward to this day every year. I love the idea of walking into one of my favorite coffeeshops, ordering a Skinny Gingerbread Latte (this year with almond milk) and knowing it's going to be in a festive cup. In a way, it kicks off the holiday season. There are thirteen designs made by thirteen different women around the world and as you can see, they are all stunning. My favorites are the Christmas Lights, the reindeer snowflake that kind of resembles a sweater and Santa with his reindeer. To add to the excitement, Snapchat got in on the fun and released a special filter in their honor. 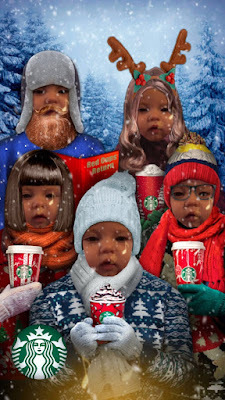 Molly and I had too much fun playing around with it this morning during breakfast while listening to Christmas music. After playing with Snapchat for entirely too long, I got Molly dressed for the day and I couldn't help myself so I put her in some of her new clothes, which are more fitting for December. Some days you just need a little Christmas spirit, am I right? The snuggle is always real with this one. After the gym we popped into Starbucks where I finally got my hands on one and it did not disappoint. The rest of the day is filled with work but I think some more Christmas music may be in order, just to keep the merriment going.